Our exchange program to Sweden is an initiative towards sensitizing our students to different cultures, to enable them to undertake the challenges of travelling, living with host families, stepping out of their comfort zone and getting a firsthand experience of the real world. It develops their personality, makes them confident and self-reliant which is a step towards making them locally rooted and globally competent citizens of tomorrow in the true sense. We have collaborated with Guteskolan, an upper secondary school in Gotland, Sweden and have been coordinating faculty and student exchange program since 2008. 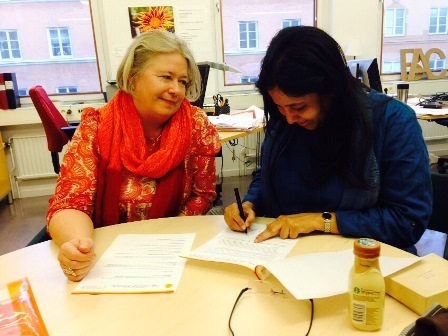 Cyber Gymnasiet, an upper secondary school in Stockholm has also been part of this exchange program to Sweden. Annelie Rohlin, Principal and her team have been very passionate, enthusiastic and energetic in taking this initiative further. 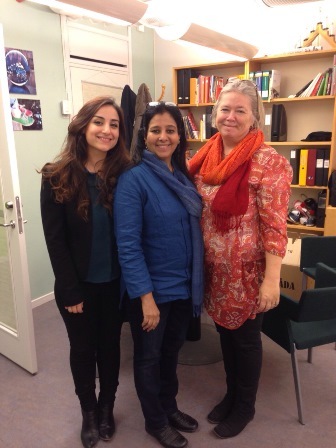 Annelie and her team have visited our school to explore possibilities of student and faculty exchange programs. They have welcomed our students warmly each year since 2012. The students have been hosted by their faculty members, and meaningful, enriching lecture sessions, well planned activities were arranged at their school wherein they could interact with their students. The students also get a touristy experience with visits to monuments, museums and shopping malls. Year after year Annelie, an extremely affectionate and fun loving person has hosted an Indian dinner for the students at her home which has been lovingly cooked by her. In order to formalize this collaboration, we have recently signed a MOU (memorandum of understanding with Cyber Gymnassiet school. 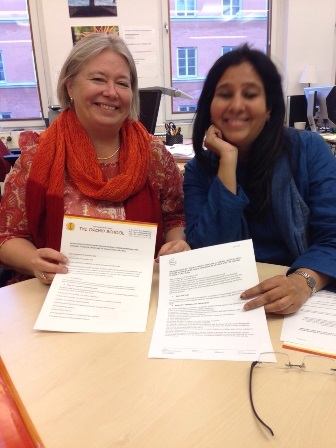 Lakshmi di, Director and Annelie, Principal have recently signed the document. Next year, a group of ten students from the current Std. XI along with two teachers will be visiting Cyber Gymnassiet. They will be there for almost 3 weeks. The students will be doing a project with their counterparts in Sweden. 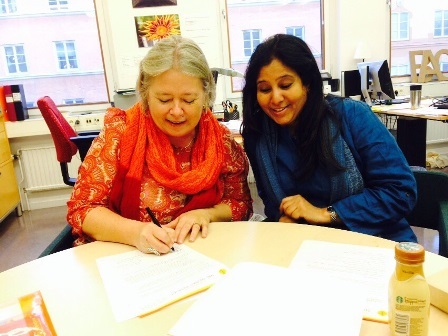 The collaboration will definitely scale newer heights with the support and cooperation from the leaders and team members of both schools, Guteskolan and Cyber Gymnasiet.